The Low Down: Alan and his brother, Nick, have to be on the move. Constantly. Magicians are after a charm that their mother wears, so it seems as soon as they’ve settled somewhere, they are located and have to hole up in another town. Nick doesn’t care much, anyway – he likes to fight, is a love-’em-and-leave-’em type and only cares about his brother. Alan’s the thoughtful, loving one who brings home strays. But this time, the strays are a girl and her brother – a brother who bears the highest mark of a demon. Which means certain death. Once Alan, too, bears a demon’s mark, they all embark on a dangerous journey to try and remove the marks. But not before learning that there are many secrets about. Best Thang ‘Bout It: Though I really do like books where the main character discovers that they or the people they are supposed to trust aren’t what they seem, this is now a common device that’s been (over) used. I like this version, though – it’s a surprise for sure. I really liked the secondary characters, too. Jamie, despite his mark, is upbeat and funny even though you know he doesn’t feel that way on the inside. Should You? : Hot guy. Dancing. Demons. Magicians. Fever Fruit. Pink hair. Yes. 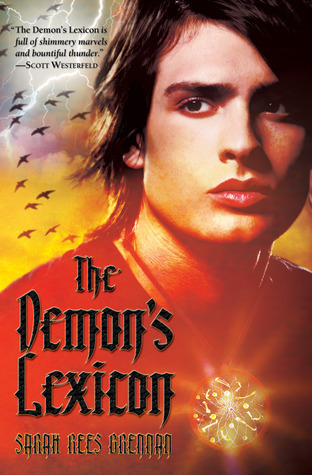 The Demon’s Lexicon was published on April 27, 2010 by Margaret K. McElderry Books. Fever fruit? Pink hair?..hmn i am curious. Oh yeah! You know you want to read it!